Now the thing about HSBC is that it is interested in more than just banking (in common with most others) and it believes that it has ‘seen the future’. Walking down the ramp to enter the plane for Poland at London’s Stansted airport, I was greeted once again by HSBC’s pervasive branding. However this time, the letters appeared above a large picture of a bumble bee.. but the humble bumble didn’t look quite right; it had been half engineered into a ‘bee-bot’. In large letters above this unfortunate insect appear the words “In The Future – Nature and Technology Will Work as One”. Now mechanised, non animal ‘bots’ (officially ‘nano-bots’) are the latest little flying military spy machines. No bigger than an actual bee – they are apparently capable of flying in swarms straight through your open living or bedroom window – and flying out again replete with photographic data gleaned while hovering around your home. Their creators suggest that the ‘bots’ might be capable of dispensing a lethal sting into their victim as well. It’s like mini drone technology whose intended victims are none other than .. us? Seeing “In the Future – Nature and Technology Will Work as One” with ‘HSBC’ in bold above it – gave me on of those “Oh my God!” moments. HSBC is implicated up to it’s neck in most of the rotten scams that the banking fraternity has pulled on it’s customers over the past decade or so – and is now continuing in the same vein by planting an almost surreally dark message into the public mind. The message being conveyed is simple enough: the bankers are to continue their power play for total control by announcing their backing of the ultimate mutation of nature. The ultimate mutation of nature? That’s close enough to the mark: how would you describe the conjoining of nature and technology within a living organism for the purpose of advancing the total dehumanisation of homo sapiens? Put another way: the usurping of the natural laws that govern our behaviour through the substitution of man-made simulated versions governed by a programmed computer chip. In the case of the ‘bots’ – a chip instructing its vehicle to carry out covert and overt spying and assassination raids on ..well, maybe anyone who refuses to be a slave. It’s a regime that intends to make it impossible to make any distinction between an ‘engineered animal’ and an ‘animalised engine’. Needlessly to say, both concepts are nefarious aberrations and should never even get as far as a drawing board. Yet this kind of thing is not exactly new. There are plenty of examples of animals having been used and abused to carry out war-like missions against stubborn enemies; or indeed being the subject of thousands of laboratory experiments of various kinds. Today, laboratories continue their experiments with the genetic engineering of farm animals to turn them into walking butchers’ shops. Laboratory design teams have already managed to splice human growth promoting genes into pigs – with biotech corporations expressing the desire to patent the resulting transgenic animals so as to claim ownership of their blood-lines. Franken Foods remain an ever present threat to us all. 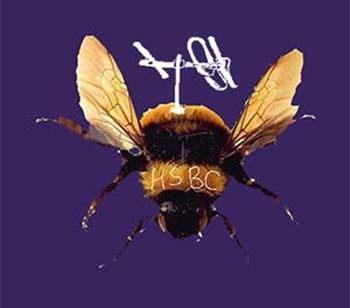 What we have with HSBC’s ‘nano bots’ is a direct extension of transgenic engineering. Their advert is an in-your-face pronouncement that the bank ‘has seen the future’ and is going to put it’s customers’ savings into making that future come to be. Say this advertisement had announced “We are splicing your genes into our pigs – enjoy your dinner”, that would, in all probability, have provoked an instant outcry by outraged citizens. But “In the Future – Nature and Technology Will Work as One” will likely not have that affect upon the majority of 21st century neocortex’s. On the contrary – it probably will sound rather soothing – like ‘ah, no more painful conflicts with nature.’ And that is undoubtedly the intention. But just under the surface lies an extraordinary admission of dark intent by this leading British bank – bringing into razor sharp focus just how pathologically insane the world of big business has become. Also just how immersed governments have become in holding hands with these corporate despots and jointly paving the way to a post Orwellian ‘New World Order’. The nano-bot is an accompaniment of the Transhumanist Movement. A movement that coolly informs that at some point in the future, humans will be out-competed by cyborgs. That the ‘brain’ we invent will outperform the one we used to invent it. That ‘humans’ will become redundant while soul-less automatons that can ‘think and feel’ will take over all areas of society where human hands and minds once prevailed. Their ‘decisions’ will then challenge ours and courts of law will be hard pressed to know how to sentence or convict an insentient cyborg when it has carried out an act of murder, or any other crime for that matter. We are perhaps 50% down that road at this very moment. Many have already been hypnotized by their gismo dominated daily lives and by the ease and speed with which transactions, free from any human contact, can take place ‘online’. Many have been seduced by the ‘thinking’ I-pod/smart phone and become accustomed to spending hours in virtual realities. Places that subtly prepare the unweary for the ‘virtual’ to make it’s next appearance as the ‘actual’. Many have been anaesthetized to the point where their actions become out of sync with their brains; so when something deeply shocking is experienced – it is proceeded by a certain numbness – and a failure to react with emotional empathy or natural spontaneity. We are, in other words, being moved ever closer to the machine state, while the machine is being moved ever closer to the human state. What the HSBC is proclaiming is the crossing over point. A time when the majority of mankind will have surrendered itself to blind belief in the technology it invented – and accepted a sterile, inhuman and robotic second place for itself: The blue pill. You would be surprised by the seductiveness of this ‘take-over’. It fulfils a barely human, yet prevalent desire in many to relieve themselves of responsibility for the management of their lives and of the fate of this planet. It offers an escape route through which can pass all those who feel overwhelmed by the task of making rational decisions or of giving birth to creative instincts. In fact, for most unquestioning followers of the status quo – it follows a natural progression from their current state of insentient, dumbed down conformity. I’m painting this dark, because it is. But I don’t believe it’s the future – I believe it’s the present – and that ‘thinking humanity’ can and will overcome this Orwellian fate. We are there. We have arrived at that great threshold – that great turning – which offers all who can still feel a sentient living pulse of life coursing through their veins – the chance to renew their contract with our Creator. To choose Life. To celebrate Life! And to draw a symbolic Arthurian sword against all that debases, destroys and dehumanises our divine fire. We will not and cannot capitulate. We are indeed enormously fortunate to have this chance to look the devil straight in the eye. We humans have never been more overtly confronted with the deathly masque of deception than we are today. It’s shouting at us on the front page of every national newspaper, every TV news programme, every political manoeuvre, every military manoeuvre, every large scale banking transaction, every hypermarket and shopping mall sell and in every artifice of mass consumerism. All designed to fog, torment and torture that divine spark that is our living essence. The cyborg sycophants and the HSBC’s of this world feed on those who fear the realisation of their own inner powers. Pay them no heed my friends, for we are just entering a long period of rejoicing in the dazzling beauty of those very powers – and will not be bowing to anyone or anything that tries to block our collective emancipation. Now is the time to draw on the true light that is so freely available, at all times, to all people. Use it to unmask and unseat those who think they are in control of our destinies. Reveal them for the empty cyphers they truly are. Their threats are paper thin when held against the flame of truth and the well-spring of love – and will turn to ashes under the steadfast gaze of an enlightened soul. Sure, it will be a bumpy ride! So oil your springs.. stay steadfast in truth. Be the being you are. Be ever ready. Tend to your fire, and do not shirk from boldly confronting all who aim to kill the spirit. For it is through our actions that the future we want will be realised. Julian is an early pioneer of UK organic farming, an international activist and a writer. He is presently president of The International Coalition to Protect the Polish Countryside (ICPPC) and author of ‘Changing Course for Life – Local Solutions to Global Problems’ www.changingcourseforlife.info His new book ‘In Defence of life – A Radical Reworking of Green Wisdom’ is to be published in November 2013. This entry was posted on 29 August, 2013 in homepage and tagged animal bots, George Orwell, HSBC, Julian Rose, mini-drone technology, mutation of nature, nick victor, Orwellian future, Transhumanist Bankers Plan Robotic Future, virtual reality. Bookmark the permalink.